Nuclear power plants are base load generators – due to economics. NECG Commentary #3 explains base load generation, the economic reasons that nuclear power plants operate in base load mode, and the capability of nuclear power plants to operate flexibly. The electricity industry dispatches power plants to meet fluctuating demand. The chart above illustrates the magnitude of this task. The chart shows 2013 hourly demand data from PJM (an acronym for Pennsylvania, New Jersey, and Maryland), a US Regional Transmission Organization (RTO) that operates a large competitive electricity market. 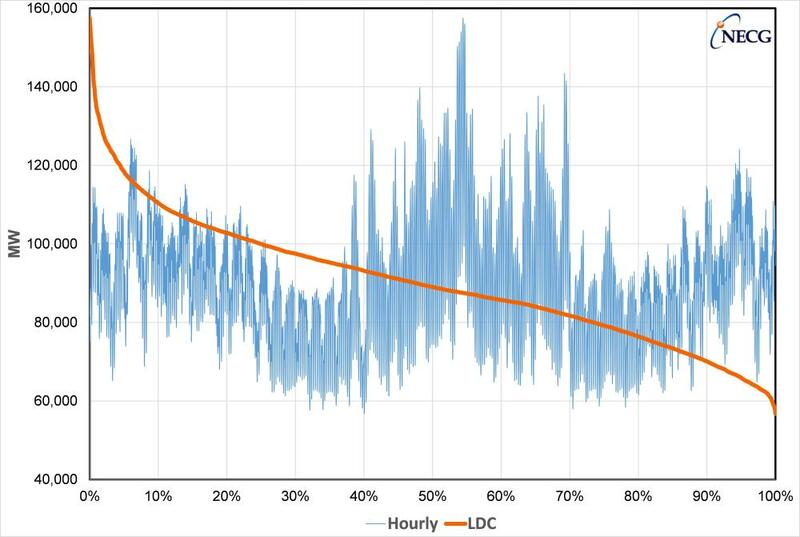 Hourly PJM system demand in chronological order in shown in blue, while system demand sorted from highest to lowest, shown in orange, is called the Load Duration Curve (LDC). The 2013 PJM maximum demand of 157.5 GW is almost 100 GW greater than the minimum demand of 57.7 GW. In any electricity system or market, the lowest-marginal-cost generators operate as much as possible for the entire year. 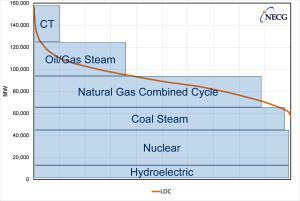 This so-called base load generation is usually provided by hydroelectric, nuclear, and coal generators, depending on the availability of generating capacity. Base load generators are operated as much as possible because they are low in the merit order (i.e., have low short-run marginal cost). The 33.7 GW of nuclear capacity in PJM operates at full output whenever it is available. The diagram below shows how power plants are dispatched to meet demand, with the short-run marginal cost increasing from the bottom (hydroelectric and nuclear) to the top (CT or combustion turbines). 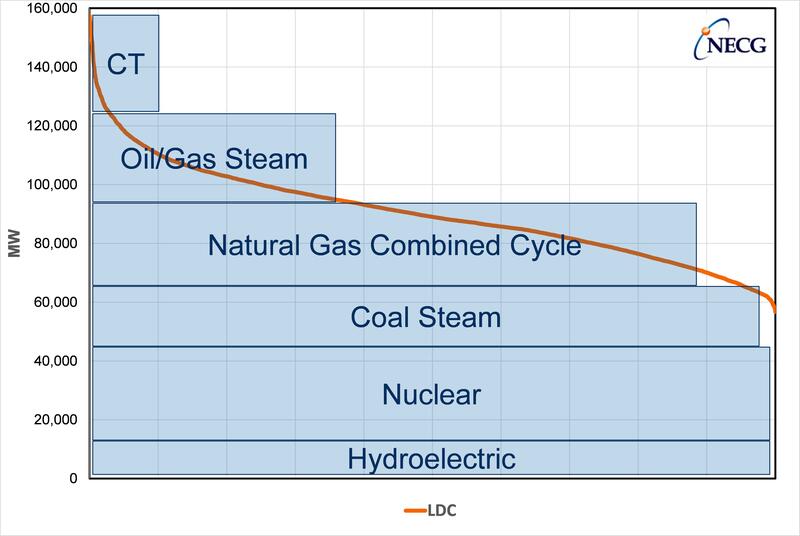 Base load units at the bottom of this diagram operate as much as possible, consistent with their low short-run marginal cost. CT units are at the top of this diagram. These units operate at peak demand and when other power plants are not available. These units can start and ramp to full output quickly, have low capital cost, and have high fuel (and short-run marginal) cost. Between the peaking and base load units are mid-merit generators. Some mid-merit units follow demand on a daily basis while other mid-merit units are operated on a seasonal basis. Mid-merit units that follow load have relatively low minimum operating levels, acceptable thermal efficiency at part load operation, a high ramp rate (i.e., the ability to change output under load), and the capability to operate in automatic governor control (AGC) mode to maintain system frequency. The difficult task of electricity system dispatchers and market operators in meeting fluctuating demand is made even more difficult by planned and unplanned generating plant outages, transmission line trips, and unusual changes in demand due to weather events. To maintain the system operation during these situations, electricity systems maintain reserves (i.e., extra generation that is available when needed). Mid-merit and peaking generators provide reserves, including spinning reserves (an operating power plant running at less than full output that can increase output quickly), fast-start reserves (power plants that can be brought into operation quickly, usually within 10 minutes), and black-start reserves (power plants that can be started and synchronized with no external power from the grid). NECG Commentary #2 explained why nuclear power short-run marginal cost is zero. Low short-run marginal cost puts nuclear power plants at the bottom of the electricity merit order, along with other base load options. Nuclear power plant fixed costs are recovered through electricity generated. An integrated electric utility with nuclear power in its portfolio would operate nuclear power plants as much as possible to displace other generating units with higher short-run marginal costs – this maximizes the value of the nuclear capacity. Similarly, a merchant nuclear project would bid into an electricity market to maximize operating levels – because electricity sales at any price above zero maximizes coverage of nuclear fixed costs and maximizes nuclear unit profits. Base load operation of nuclear power plants over several decades has led nuclear generation companies to develop operational procedures and techniques aimed at maximizing output and managing fixed costs. Some industry observers conclude that nuclear power plants cannot operate flexibly because most of them operate in base load mode (i.e., not as flexible generators). This is not correct. Nuclear power plants can operate flexibly. Advanced light water reactor designs include the capability to operate at levels well below full output, to increase output at ramp rates comparable to other conventional power plants, and to operate in AGC mode to provide system frequency control. Some operational nuclear power plants already operate in a flexible mode. About 75% of France’s total electricity comes from nuclear power. The large contribution of nuclear power capacity combined with normal demand variations means that some nuclear power plants are required to follow load and to provide frequency regulation in France. EDF’s approach to flexible nuclear power plant operation uses special “grey” control rods and a coordinated approach to flexible operation across the fleet. The Columbia Generating Station nuclear power plant, located in the Pacific Northwest with a large amount of hydroelectric generation, is operated flexibly to allow the regional system dispatchers to manage the large hydroelectric system. A 2011 OECD/NEA report provides a detailed discussion of flexible operation of nuclear power plants. Flexible operation of a nuclear power plant means that the nuclear power plant will operate at less than its potential output level, resulting in lower revenue and lower profits compared to the same unit in base load operation. Depending on the nuclear power plant design and the degree of flexibility, operating costs may be higher than base load operation. Absent some compensation for lost output, it is unlikely that a nuclear power plant owner would choose flexible operation. Compensation for flexible nuclear power plant operation may be justified. An integrated utility may see lower total system costs due to lower investment and operating costs for flexible conventional power plants that are not needed due to flexible operation of nuclear power plants. An electricity market may provide compensation for flexible nuclear power plant operation in payments for ancillary services or reserves. If the value of flexible operation is high enough, it may more than offset the lost profits from lower output levels. A new nuclear power plant that is expected to operate flexibly when completed will have worse project economics than the same nuclear power plant is it is expected to operate in base load mode. The nuclear power plant with flexible operation must recover fixed costs by placing a higher price on power output. In some electricity systems and markets, increasing amounts of intermittent wind and solar generation has been added. Intermittent means that the amount of generation from these types of capacity changes over time in a way that is not linked to system demand. These generation types are also considered as non-dispatchable resources, because system dispatchers or a market operators cannot call on the intermittent units to generate power as needed to meet fluctuating demand. Wind and solar generation share some economic features with nuclear, including a zero short-run marginal costs. Like nuclear power plants, the revenues and profits of these generators are maximized by generating as much power as possible. These intermittent generators add a new problem for system dispatchers and market operators. In addition to operating controllable power plants to meet varying demand, system dispatchers and market operators now need to operate controllable power plants to meet varying output from these intermittent generation sources. A small amount of intermittent generation (e.g., about 10%) may be added with little or no change in the system operation using the existing portfolio of dispatchable generation and reserves. A large amount of intermittent generation on a system may mean a need for additional fossil fuel generation to meet fast changes in intermittent generation output. This may also mean that units traditionally operated in base load mode, including nuclear power plants, must operate flexibly and at lower annual output levels. Nuclear power plants usually operate in base load mode because of the economics of the nuclear power plants and the electricity systems in which they operate. Nuclear power plants can and do operate flexibly, but flexible operation usually means lower profits for nuclear power plants.